This contains 13cm x 13cm samples of all 17 of our current fabrics. The sample book will give you a great idea of what fabric is most suitable for your project. 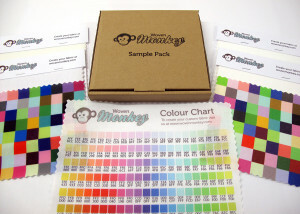 Get a discount when ordering both the colour chart and sample pack together. The colour chart is a great help when designing fabric. It is printed on our Plain Cotton and provides you with 176 colours and the RGB hex codes for use in any design software.